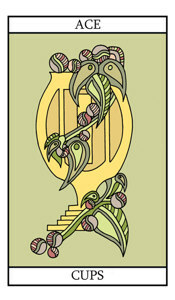 The Ace of Cups symbolizes that there are opportunities out there to bring happiness into your life. Now might be a good time for emotional and spiritual development. You may find that ideas are starting to flow as the Ace is symbolic of that creative spark or attraction between people. You may also be finding that somewhere deep inside you new thoughts are beginning to emerge and you may be thinking about some form of psychic development. This is a positive card if you have just started a new relationship and can indicate that things generally look promising in that area. The waters are beneath, and thereon are water-lilies; the hand issues from the cloud, holding in its palm the cup, from which four streams are pouring; a dove, bearing in its bill a cross-marked Host, descends to place the Wafer in the Cup; the dew of water is falling on all sides. It is an intimation of that which may lie behind the Lesser Arcana. Divinatory Meanings: House of the true heart, joy, content, abode, nourishment, abundance, fertility; Holy Table, felicity hereof. The Ace of Cups Card illustration.